I figure the first of February can mark the start of a whole new set of resolutions. Why should New Year’s Day have all the fun? Last month, I did quite a lot of financial spring cleaning, checking if we could get better deals on our savings, current account, electricity bills and credit card (brief answer: yes). So this month I’d like to focus on food, and eating more healthily for less money. 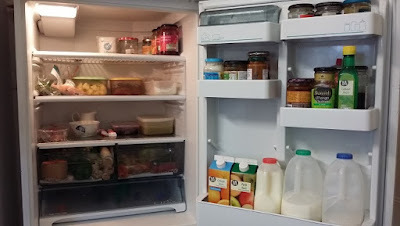 Our food bills have crept up since I did the store cupboard challenge last June (summary post here). During January, we spent just over £60 a week to feed our family of four, including assorted excitement for a children’s party. 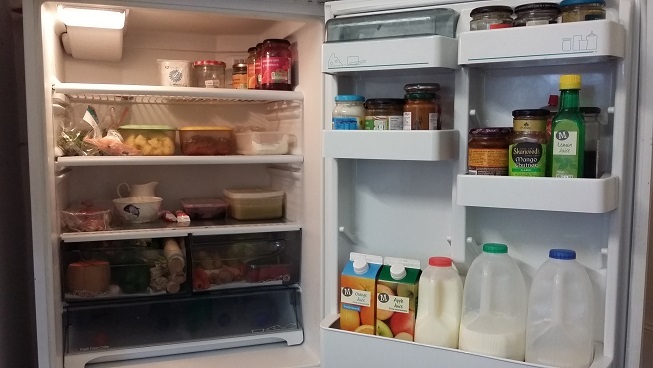 I actually feel quite pleased that this is less than the £67 a week before the storecupboard challenge. However, I reckon we could still eat well without paying so much. Looking on the bright side, at least we now have a fair amount of storecupboard staples and assorted protein stashed in the freezer. Generally, I aim to keep our food costs in check by cooking from raw ingredients as much as possible, rather than buying processed food. 3. Plan our meals, rather than getting to 5pm and staring at the fridge. Other than grabbing the odd bit of parsley from the garden, we won’t be living off home grown produce any time soon! Anyone else up for cutting their food bills during February? What are your own top tips for eating healthily while spending less? All of the above. Plus – in celebration of the UN's declaration that 2016 is the year of pulses, we are eating more beans and lentils. I am encouraged that you do not have garden produce to hand – but this is the year I WILL manage to grow more edibles. I am determined! Would love to join your resolution to grow more edibles this year – I've been hoarding seeds, but didn't manage to get round to planting anything last year, apart from a few bulbs and herbs. Eating more pulses seems to be a bit of a theme! I will go and stare at my bag of lentils in hope of inspiration, and keep an eye out for nettles too. I'm hoping to cut our food bill for the entire year. We starting off by eating down the freezers and cupboards, hopefully by the time we see the bottom of the freezer and the back of the cupboards the polytunnel will have kicked in big time. But I am pleasantly surprised that due to the unusually mild weather this Winter we are still eating lots of produce from the polytunnel even now. Lettuce, spring onions, carrots, cabbage, celery, kale, spinach and radishes and we even still have turnips in the veggie patch that I am picking as and when I need them. Even growing your own herbs will save you a fortune on the supermarket prices. Just try and expand from there and pop a few of your seeds into tubs or pots to get yourself off to a good start for this year. And I think £60 for a family of four is pretty good, a lot less than some people spend for just themselves!! Brilliant that your polytunnel is providing so much even during the winter. Do you have any recommendations for easy to grow veg that I could plant at this time of year? Was thinking I could maybe get some salad leaves started on the kitchen window sill, for example. Yes, salad leaves will grow now and you can start herbs off indoors on the window sill. And it's good to get Spring Onions in early they takes AGES to grow!! Glad you enjoyed the article and blog on heating oil!